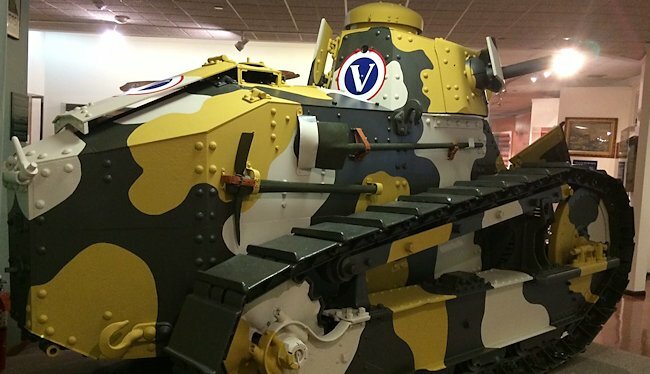 This restored US Army M1917 6-ton WW1 light tank can be found at the Virginia War Museum, in America. It is a licensed built copy of the French Army WW1 Renault FT tank. 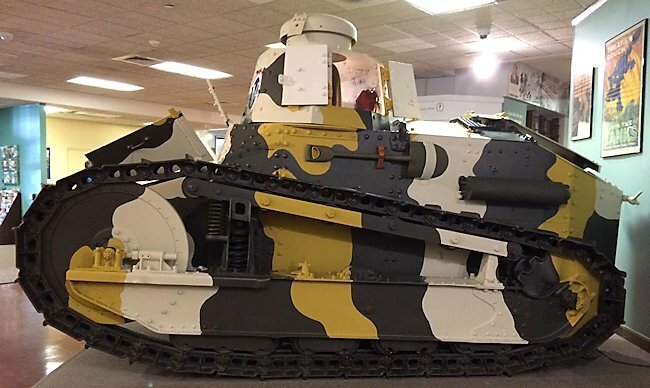 This restored M1917 6 ton light tank can be found at the Virginia War Museum, Kawana Cir, off Warwick Blvd, Newport News, Virginia in America. The Museum is only open in the afternoon on Sunday. It open 9am to 5pm Monday to Saturday. Although the tank is called the 6 ton tank it weighed around 7.25 tons. It was powered at first by a Buda HU modified 4-cyclinder, with forced water cooling gasoline petrol engine that produced 42 hp not the French Renault 4-cyl, 4.5 litre, thermo-siphon water-cooled engine that was fitted to the Renault FT tanks. Its maximum road speed was only 5 mph (8 km/h) and it had an operational range of 30 miles (48km) before it needed to refuel. The two man crew were protected by armour that ranged from 8mm to 22mm in thickness. This would only stop small arms fire and shell shrapnel. 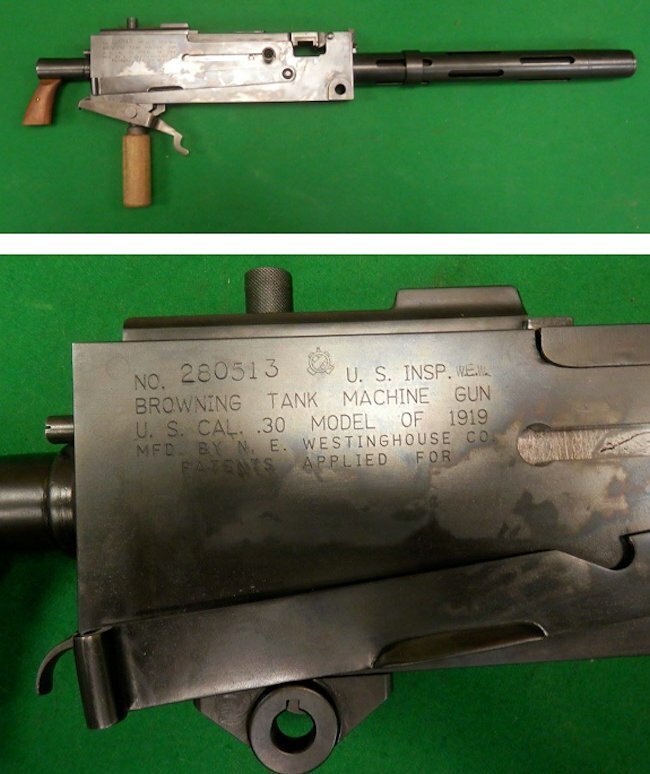 The French machine gun was replaced with a Marlin M1917 machine gun and later with a M1919 Browning tank machine gun. A few of the tanks were armed with a 37mm M1916 gun that could fire high explosive HE shells. When the United States of America joined the Allies on the battlefields of France and Belgium in WW1 April 1917 the US Army Expeditionary Force did not possess any tanks. Their officers inspected the British and French tanks and decided the French Renault FT tank would meet their needs until more British style heavy tanks could be manufactured. The French factories were fully committed in producing tanks to meet the needs of the French Army. There was no spare capacity in France to build additional tanks for the US Army. The Americans quickly conducted negotiations with the French government and obtained the license to start production of the Renault FT tank in America. For security reasons the early tanks were just called ‘6 ton special tractor’. Later they was given the official designation Model 1917 6-ton light tank. This was more commonly abbreviated to just M1917. The US Government placed an order for 4,440 tanks to be built but only 950 were produced before the order was cancelled. Only 64 M1917 tanks had been completed by the end of the war. Ten American built M1917 tanks were delivered to France before World War One finished on 11th November 1918. None of them saw active service on the front line. The letters FT do not stand for ‘first tank’ or the French terms ‘faible tonnage’ (low tonnage), ‘faible taille’ (small size), ‘franchisseur de tranchées’ (trench crosser), or ‘force terrestre’ (land force). It was not named the FT 17 or FT-17 during World War I. All new Renault projects were given a two-letter product code for internal use, and the next one available was 'FT'. Do not look at this tank with modern eyes. Tank on tank combat was not a consideration in the design of this vehicle. The Germans only produced 20 A7V heavy tanks during WW1. These tanks were the solution to the problem of how do you cross ‘no-man’s land’ under rifle plus machine gun fire and breach the enemy’s front line of trenches. Most of the Renault FT tanks used in the war were only armed with machine guns. A few were mounted with cannons to deal with fortified bunkers and machine gun positions. They worked with machine gun armed tanks who protected them from infantry attack. Many books and websites state that the design of the Renault FT armoured fighting vehicle was the first to use a turret that traversed 360 degrees. That statement is not true. Before the war and during the early part of the war turrets were used on armoured cars. The Renault FT was the first tank with a turret that traversed 360 degrees to see action on the battlefield. The tank was operated by a two man crew. 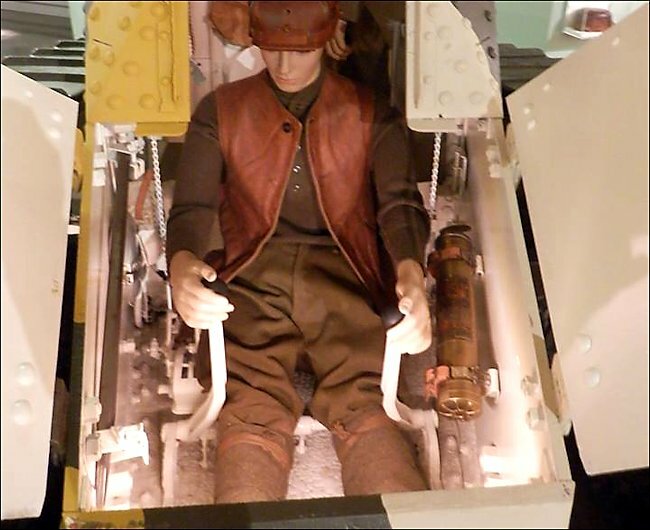 The driver sat in the front of the tank in the middle and the commander operated the turret and gun. The commander had too much to do. He had to look out for enemy targets and dangers, load the gun, traverse the turret, fire the machine gun and give directions to the driver. He also had to read the map and co-ordinate with other tanks and infantry units. The tanks were not fitted with radios so the commander had to use flags, hand signals and shout commands at other units. The Tank had a number of good design features that were advanced for the time. The front armour plate that protected the driver was slopped. 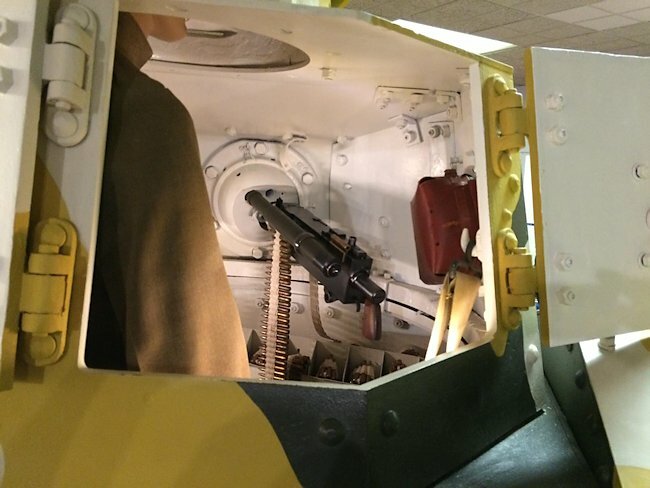 The armour was thin but slopping increased the thickness of metal any enemy bullet had to pass through before it penetrated the interior of the tank. 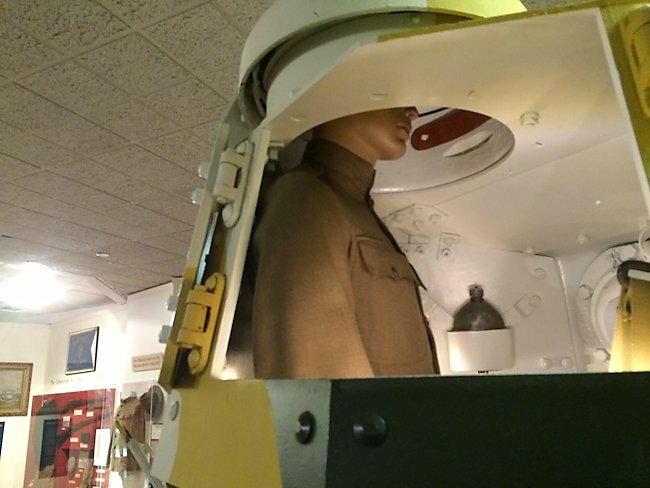 The angle of the armour also helped deflect incoming enemy bullets. The tank tracks were comparatively wide for the time and this helped enable the tank to cross muddy ground. 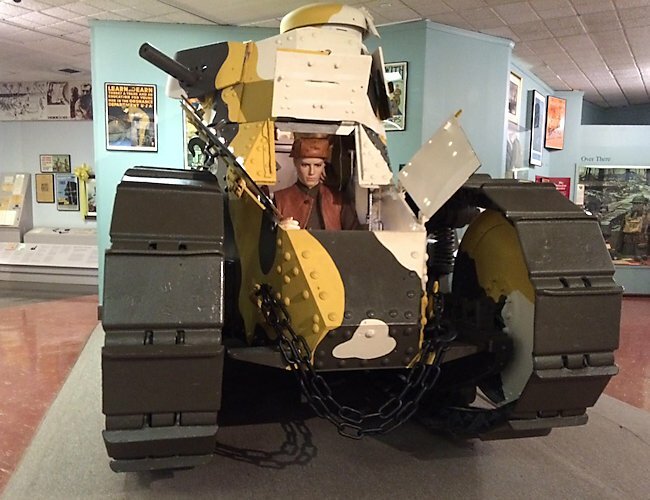 The American engineers made some alterations to the original French Renault FT tank design. Some of these features were cosmetic and others were done to assist in the problem of supplying none standard ammunition and equipment to front line troops. The most noticeable was the removal of the French Hotchkiss 7.9 mm (0.32 in) machine gun. It was replaced by an American made caliber .30 Marlin machine gun that accepted the standard US .30 ammunition. The US designers changed the engine. The French Renault FT tank was powered by a Renault 4-cylinder, 4.5 litre, thermo-siphon water-cooled, gasoline petrol engine. The American’s replaced it with a Buda HU modified 4-cylinder, with forced water cooling, gasoline petrol engine that produced 42 hp. This initial engine replacement did not enhance the maximum speed of the tank. It still propelled the vehicle at only 5 mph on the road and it only just managed to keep up with advancing friendly troops across country. It only had an operational range of 30 miles before it needed to be refuelled. In modern warfare this would be a problem but for Allied tanks involved in WW1 offensives the enemy front line was only 100 to 200m away and any breakthrough would normally only cover a maximum of 6 miles. 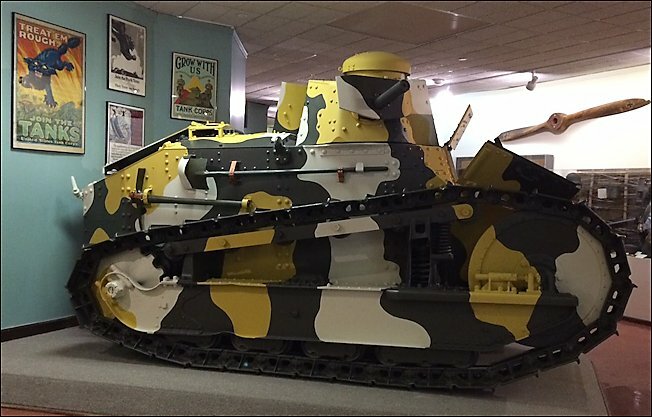 Visually you can spot the difference between the Renault FT and the US Army M1917 tank by looking for these features. The exhaust on the M1917 was positioned on the left hand side of the tank instead of on the right. The machine-gun and 37mm cannon gun mantel was replaced with a new design. Solid steel idler wheels replaced the French steel-rimmed, wooden or seven-spoked steel ones on the Renault FT tank designed tanks. The American designers added additional vision slits in the armoured body work to aid the driver. All US Army M1917 light tanks had polygonal turrets and not the cast metal circular turrets fitted to nearly 50% of French Renault FT tanks. For those that like to look closer at the differences between different tank types the frontal armour below the turret on the US M1917 was slightly modified from the original French design. The track tensioning mechanisms which move the idler wheels forward or backwards are different. The US Army M1917 tank has an assembly in which a bolt is used to set the tension, and 2 pairs of interlocking toothed plates lock together to hold the axle in place, removing strain from the relatively weak bolt. A self-starter was fitted to the engine and a bulkhead was added to the chassis to separate the crew from the engine compartment. Although 10 American built M1917 tanks were delivered to France in the Fall (Autumn) of 1918 they never saw action before the end of WW1 on 11th November 1918. For financial reasons the US Tank Corps was demobilised in June 1920. The tanks were issued to different infantry regiments. The number of working tanks available started to diminish due to accidents, fires and mechanical failures. Some tanks were cannibalised to provide spare parts for other tanks. A few tanks were scrapped whilst others were ‘mothballed’, kept in storage. Where can I find other preserved M1917 Light Tanks?